Audi adds more heat to its A5/S5 Sportback family with the new RS 5 Sportback. The BMW M3 and Mercedes-AMG C63 are high-profit cars that sell quickly. Why is there no Audi competitor? I can't believe the Audi Quattro doesn't sell for way more money. I've been very vocal in complaining over the last few years about the sheer lack of high-performance Audi models -- the RS4, the RS6 and high-performance versions of the SUVs. They all exist, but they aren't sold in North America. 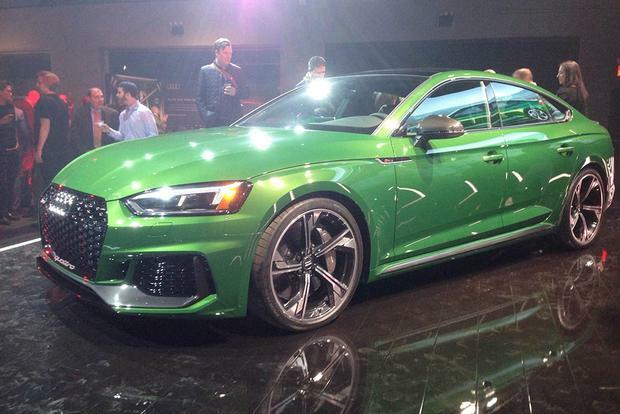 Finally, Audi is starting to change that with models like the RS3, the RS7 and the new RS5 Sportback. The RS5 Sportback has just gone on sale, and I recently drove it at Fletcher Jones Audi in Orange County, California. I'll start with the particulars: this car has a turbocharged V6 with 444 horsepower and 443 lb-ft of torque, which are both big numbers that go way beyond Audi's current performance car of this size, the S4, with its paltry (by comparison) 349 hp. As its name suggests, the RS5 Sportback has a different "back" than a sedan -- in this case, it's a hatchback, which makes it more practical than rivals. It also has a starting price of around $75,000, which is big money considering that it puts up roughly the same numbers as the Mercedes-AMG C63, which starts around $7,000 cheaper. Nonetheless, I love the RS5, and there are a few important reasons why. One is, in fact, that hatchback body style. Audi doesn't seem to want to bring us true high-performance wagons like the RS4 Avant and the RS6 Avant even though they've been selling those cars globally for years, but this is the next best thing -- and I love the idea of a car that's both fast and practical. The RS5 Sportback is that, doing the 0-to-60 mph run in 3.9 seconds while simultaneously having ample room for four people and more cargo space than a Porsche Panamera. The RS5 Sportback is also gorgeous. For the last decade or so, Audi hasn't made an ugly car -- and the A5 Sportback is the latest excellent example of it. "RS"-ifying this car has made it even more desirable, of course, with larger wheels and slightly more thrilling trim and other upgrades. 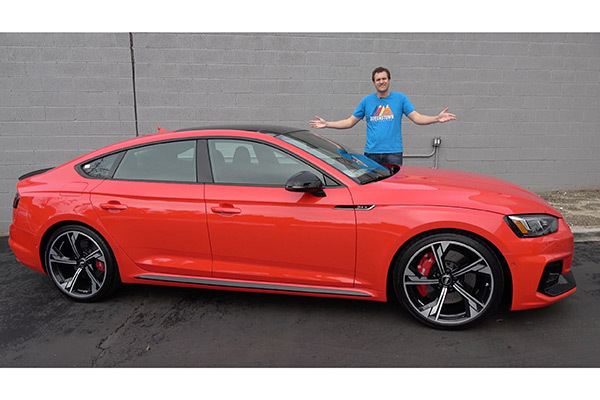 But it still has the same gorgeous lines as the regular A5 Sportback -- and, maybe best of all, it's not excessively over-the-top "look at me" with brightly-colored brake calipers, and big air inlets and similar modifications. It looks just subtle enough to not seem as fast as it actually is. And then there's the performance. The RS5 Sportback is a thrill to drive, though I think its real strength comes in handling. It feels nimbler than the larger RS7, and interior space isn't very far apart, so it's easy to see why the RS5 Sportback is a bargain compared to the 560-hp RS7 and its $114,000 base sticker price. My issue with the RS5 Sportback is that it doesn't quite feel fast enough to justify its pricing -- not over rivals like the BMW M3 and the Mercedes-AMG C63, which it's on par with, but rather over the smaller Audi RS3, which feels nearly as fast and costs about $20,000 less (with only a 50-hp disadvantage). The real benefit of the RS5 Sportback, therefore, is its additional size over the RS3, not its additional performance, as shoppers who can fit into the smaller Audi probably should. But for those who want a high-performance Audi to do it all, the RS5 Sportback is that. It's as fast as an M3, it's got near-wagon storage space, it looks nice, it's got great tech and it's all-wheel drive -- a benefit for drivers up north. It's an excellent car, and a great all-around package -- and I'm thrilled Audi has brought us another desirable "RS" model.